A determined ex-soldier who was left paralysed after a routine operation went wrong is to take on his toughest challenge yet to raise money for a teenager who suffers from a debilitating illness. Inspirational Kirk Mount (28), a former Sabden resident who now lives in Padiham, will attempt to set a new world record when he rides from John O’Groats to Land’s End in his wheelchair in August. He will aim to cover 1,000 miles in just 40 days, with a few rest days, and camp out in a tent along the way to raise £15,000 for Tiffany Wrigley (13), from Rishton. Schoolgirl Tiffany fought against a life threatening condition that left her on a hospital ventilator for nine months. She has been diagnosed with Transverse Myelitis, a rare disorder of the central nervous system, is confined to a wheelchair and breathes through a ventilator. 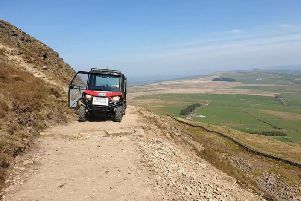 Kirk, who climbed Pendle Hill last month, dragging his wheelchair behind him, said: “I met Tiffany at the Local Hero Awards and her story was very touching. I didn’t fund-raise for my last challenge but this is going to be the final one so I’d like the money to go to a good cause. “I’ve started training but I push myself in my wheelchair every day so I’ll carry on doing that. Kirk, who has had a wheelchair donated by Liverpool company Da Vinci Mobility, will pull a trailer behind him with all his camping equipment. And Kirk said he has had a mixed reaction from friends and family about his next adventure. Emma Jackson, Tiffany’s mum, said Kirk was a great role model for her daughter. “I can’t believe Kirk’s raising the money for Tiffany, we were gobsmacked when he told us. When we met Kirk for the first time he came up to Tiffany, because she’s in a wheelchair and on a ventilator. “He really made an effort to talk to her because he had been in a similar position. To sponsor Kirk visit https://www.gofundme.com/txn3vtcs.